Chinese President Xi Jinping urged world leaders to reject protectionism at the World Economic Forum in Davos, Switzerland. His speech in support of free trade came during the first day of the yearly meeting of political, business leaders, activists and artists. The Chinese leader also spoke days before the inauguration of Donald Trump as the 45th president of the United States. Trump, a Republican, won the presidency after campaigning against free trade agreements that, he said, have cost Americans jobs. Trump has threatened to increase tariffs on Chinese goods unless China changes policies that he has called unfair. Trump also has promised to withdraw the United States form the 12-country Trans-Pacific Partnership trade deal negotiated by the Obama administration. Speaking in Davos, the Chinese leader warned against trade disputes. Without saying Trump’s name, Xi said no country would win a trade war. Xi’s visit to the annual World Economic Forum is the first by a Chinese president. It takes place as Xi tries to position his country as a world leader as other countries increasingly look inward. Last year, China created the Asian Infrastructure Investment Bank. Establishing the bank was part of China’s effort to increase its influence in world finance. China’s money, the yuan, also joined the dollar, pound, euro and the yen as one of the world’s major exchange currencies. An adviser to the President-elect is attending the World Economic Forum in Davos. Anthony Scaramucci is giving up his U.S. financial business to work with the new Trump administration. Others have said Trump may be more interested in making trade deals with individual countries, or bilateral deals. President Xi’s speech in support of free trade came as his cabinet in Beijing Tuesday reduced limits on foreign investment in Chinese banks and its financial industry. However, no further details were offered. In his speech, Xi said the world’s economy needs better governance to find ways to reduce the growing divide between rich and poor. “This is the biggest challenge in the world today,” he said. Xi called for a “new growth model” that deals directly with climate change, aging populations and increased automation. Automation can reduce costs and speed production of products, but it also reduces factory jobs. Senior Chinese government figures joined Xi in traveling to Davos. In past years, the Chinese government sent lower-level officials. Klaus Schwab is the founder of the World Economic Forum and its chairman. He said the world is increasingly looking to China for leadership. Schwab helped start the Forum in 1971. It has become one of the world’s largest gatherings of government and business leaders to discuss major international issues. 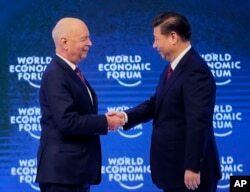 China's President Xi Jinping, right, is welcomed by World Economic Forum founder Klaus Schwab. Former Swedish Prime Minister Carl Bildt reacted to Xi’s speech on social media: “There is a vacuum when it comes to global economic leadership, and Xi Jinping is clearly aiming to fill it. With some success,” Bildt wrote on Twitter. Bruce Alpert adapted this story for Learning English based on reports by the Associated Press and Reuters. Mario Ritter was the editor.